Selling Rolling Plate or bending roll machine is a machine used to convert plates into round rolls. PT. 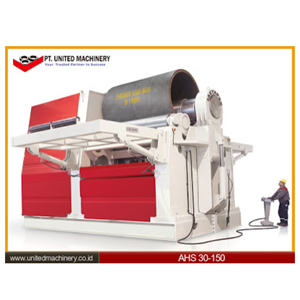 United Machinery Sell Rolling Plate Machines are used to form plate sheets in a circular manner. Sell ​​Rolling Plate Machines are used for small work on tanks, boilers, container trucks, to large workmanship such as wind towers, off-shore platforms, shipyard, aerospace and aircraft applications. PT. 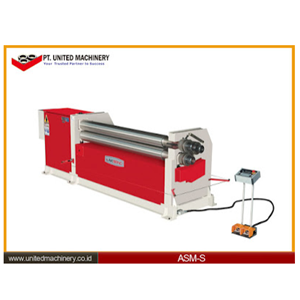 United Machinery Sell Rolling Plate Machine with various sizes according to needs. For special specifications, please contact us. Rolling Plate or bending roll machine is a machine used to convert plates into round rolls. The three-roll variable degree works by having all three scrolls move and tilt. The top roll moves in a vertical plane and the side roll moves in the horizontal plane. When rolling, the top roll presses the metal plate between the two side rolls. The advantage of having a variable three roll is the ability to roll many cylindrical thicknesses and diameters. As an example; The sides are what produce mechanical benefits. With side rolls all open, one has maximum mechanical advantage. With side rolls along the entrance, you have the smallest mechanical advantage. So, the machine has the ability to roll material 2 inches thick with maximum mechanical superiority, but the work is only 1/2 inch thick. Reduce mechanical superiority and one has a machine that can roll from 1/2 to 2 inches thick.